Messaging on smartphones is assumed to be secure, but recent reports of new threats to user data integrity has created a renewed interest in the BlackBerry BBM robust messaging service. Meanwhile, independent software developers will offer enhanced app-based encryption solutions for other smartphones. 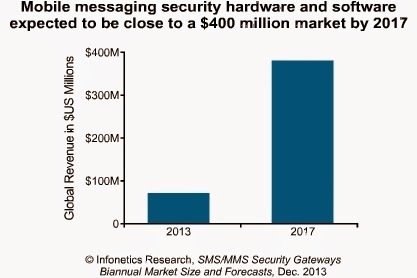 Infonetics Research released excerpts from its latest global market study of short message service (SMS) and multimedia messaging service (MMS) security hardware and software -- such as SMS firewalls and mobile messaging security platforms. "The popularity of SMS and MMS has soared over the last decade, but carriers around the globe are just now beginning to seriously evaluate and deploy mobile messaging security solutions, forced by economic, regulatory, and attack conditions," said Jeff Wilson, principal analyst at Infonetics Research. Infonetics has identified an important trend that is a result of more government regulatory pressure across the globe. Major mobile network operators in a region may be looking at SMS/MMS security solutions as a group and then selecting a single vendor or technology. This nascent trend is causing initial adoption to happen very quickly in some regions, such as the Cloudmark and TeleDNA recent deployments in India. Ongoing concerns about the U.S. government sponsored NSA spying on Americans and foreign nationals may also be a key factor in the growing demand for these solutions. Around 10 trillion SMS/MMS messages are generated annually, opening up new opportunities for spammers, hackers and illegal government surveillance. As a result, mobile network operators are stepping up spending on security gateway solutions designed to combat SMS/MMS related threats. For the full year 2013, the global SMS/MMS security gateway market is projected to reach $70 million, that's a 70 percent increase over 2012. Cloudmark, which closed out 2013 particularly strong, and AdaptiveMobile are the current revenue leaders in the SMS/MMS security gateway space. Infonetics expects the next 12 months to bring consolidation to the SMS/MMS security gateway industry, with major networking or telecom equipment suppliers and focused network security players entering the fray. Worldwide, the SMS/MMS security gateway market is forecast by Infonetics to grow at a 56 percent compound annual growth rate (CAGR) from 2012 to 2017.